I’m all for the slow and steady approach to change. It took me years to completely declutter our home, become debt-free, retool my calendar and get my life back. Each change took longer than I thought it would but once it was complete, I knew it happened at just the right pace. Interspersed in all the slow and steady were little bursts of fast and furious. These little bursts helped me maintain motivation to stick with my tiny shifts that were contributing to years of massive change in my life. While we were decluttering, we had our “last yard sale ever” and donated everything we didn’t sell that day instead of dragging it back in the house to sell at another yard sale. Instead of TV free nights, we called the cable company and cancelled our account. When I got a bonus from work, instead of shopping or treating myself to a weekend getaway, I applied it all to debt. I started minimalist fashion challenge Project 333 instead of slowly decluttering my closet. The bursts weren’t the norm. The norm was day by day, dollar by dollar, shirt by coffee cup, inch by inch progress. If you are in the long process of simplifying your life, try this decluttering burst. Set your timer for 60 minutes and get rid of 100 things. Grab a box for trash, and a box for donations. Next, choose the recommended areas and items below that resonate with you (or create your own) to equal 100. Write down what areas you are going to attack and how many items you will declutter from each. When you start the timer, use your list so you don’t have to waste time thinking about where to start. Suggested items: expired cosmetics, products you never use, extra towels and toiletries. If you find unopened boxes of toothpaste, soap, shampoo or toothbrushes that you won’t use, donate them to a local homeless shelter or distribute in your homeless community. Suggested items: If you haven’t used it in months, don’t know what it is, or are saving it “just in case” (because just in case means never). Suggested items: duplicate measuring cups. Appliances you don’t use. Extras: dishes, cups, dish towels. Food: trash expired food and donate anything unopened from the pantry you never use. Suggested items: shoes and clothes you stashed just in case but never wear. Travel cups and paper clutter. Your car is not a storage facility. Suggested items: junk email. Documents you haven’t opened (ever). Blurry photos. Clutter isn’t always visible. Suggested items: Extra towels, sheets, blankets. Suggested items: Anything you aren’t using that is taking up the space you need to create. Suggested items: extra books, decorative items you don’t enjoy, extra furniture, nightstand clutter. Suggested items: Clothes that don’t fit. Shoes that give you blisters. Anything with a price tag on it. Things you don’t like to wear. If you are ready to end closet chaos, try Project 333. Suggested items: Clothes they don’t wear and toys they don’t play with. Include your children and ask them to fill a box with things they’d like to donate to children who have much less than they do. Suggested items: anything in a box that you don’t use, miss or remember. Things you are saving “just in case” (because just in case = never) Aspirational items – get rid of things you a bought for a life you thought you wanted but don’t. 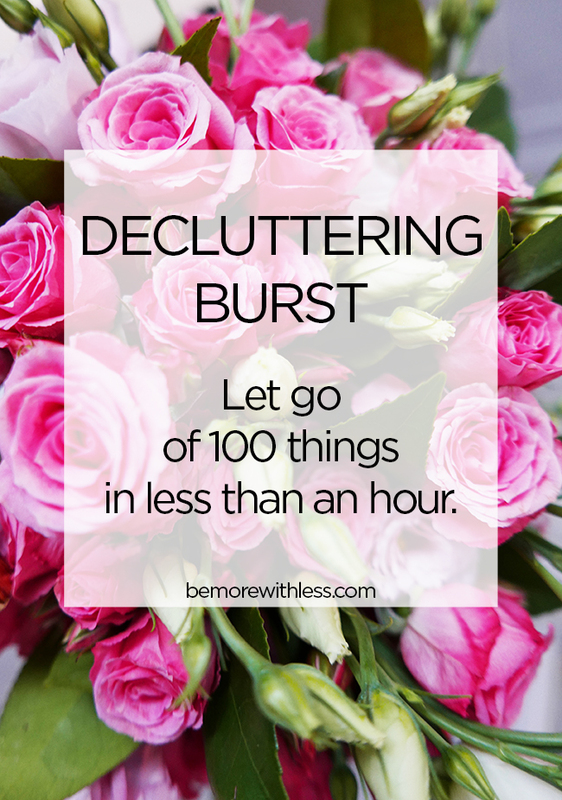 Try the decluttering burst to inspire long-lasting change in your life. Big change takes time and can sometimes feel heavy and frustrating. Find ways to have fun along the way. You’ll be so glad you took time to enjoy the journey. I hope this decluttering burst helps! I already had a big declutter on the agenda for the weekend but you’ve really inspired me to do more of it. Thanks! # I did it! It’s actually some of my Mom’s things. She, a 93 1/2 yrs young at heart, passed in July and had been living with me 2 years ago and then with my sister this past year. Her health/stamina began to fail 6 months ago so I had begun the clothes that no longer fit. Now it is more personal items. Thanks you for the encouragement. I know these items will help someone in need. I also grabbed some of my books and tossed some unnecessary papers. Brilliant posts. My life has changed since getting these mails. I just love decluttering and it makes me feel so much lighter. I’m still at it. Thanks again. I’ve been wanting to do more decluttering of the tiny miscellaneous junk in my home and always feel like I may need them. The non-big items are hard to distinguish value. I have a box full of EO bottles, cosmetic bottles, jars. I see it everytime I’m in my closet but feel like they’re worth something because companies out there selling Amber glass bottles. My desk I can never keep organized with so much miscellaneous. This is just what I need for the push!! I did it!! I had been planning to declutter our kid books this weekend but this post inspired me to declutter quite a few more than I would have otherwise. I was able to donate 100 kid books! And it really didn’t take that long to do! Thanks for the push!! I did it! Like the poster above, a lot of the things I got rid of were from my deceased mother. As an only child, I received EVERYTHING from her home. I am only keeping what really meant something to her and to me. Just because I get rid of a piece of paper with her writing on it doesn’t mean I’m throwing her away. Thank you for this mini challenge!! This really motivated me today. It’s a gloomy day weather wise…perfect for one hour of decluttering. Expired medicine, old cosmetics, linen closet overload, puzzles, and no longer used garden stuff. Yippee! I did it! Took me 1.5 hours because I got sidetracked putting things away. I’ve been on a decluttering rampage for 3 years and didn’t think I had 100 things to get rid of. What an eye opener! The subcategories really helped make this task doable. Thanks so much, Courtney! 100 items – mostly recycle and trash. Old papers and doodles and ripped children’s books. Hurray for a great start to the weekend! I did it! Thanks for providing this kick in the pants I needed this weekend. I will be starting today. I am posting this to get the new posts sent to me for motivation! I read your email this morning and I started deleting emails from my inbox…I ended up deleting well over 100 but i kept thinking, “why did I keep this?”. Thanks for the inspiration…my clothes are next. In the last four years, since my husband died and I moved into an apartment, I have been doing the 100 (must be 200 by now). I am down to the minimum in most places (and have the donation sheets to prove it). Two places still to do: the closets, and the garage. I am down to two sets of sheets for each of two beds, most craft stuff gone, surfaces bare or with small decorative stuff, the bathroom supplies down to one spare, or sometimes no spare. I am working on ‘just in time’ replacement. I have two fry pans and 3 pots. Specialty kitchen stuff is gone. All the exercise stuff is sold since I am now going to a class. Christmas is paired down to a minimum. Two things for Halloween.I am getting there and should be done soon. Maybe this year. Sounds like you are doing a fabulous job, Marge. You inspire me! I’m as decluttered as can be, but am always inspired to stay this way by articles like this. I thought this was going to be so hard, but once I started going around 100 things was surprisingly easy! Especially since I’ve been doing the project 333 since May I think? So I had this HUGE plastic tub of clothes that are not in my rotation and I was brutal clearing them out! That and some unneeded things from all around the house, as well as a bag of trash from food in the fridge. Thanks for the inspiration! I did it! I live pretty decluttered already, but decided to declutter my entire DVD collection, with the exception of my Harry Potter DVDs 🙂 Also donating some extra quilts as winter is fast approaching in MN! I did it! I touched on how appropriate it was that I got the email to declutter at this time- I’m about to spend a year serving with AmeriCorps and am making more room for love! A little extra motivation to declutter never hurts!! I did it! Yes! In less than an hour, I got rid of well over 100 items…from pots with lids to books and frames to undershirts and scarves! I “found” you Courtney over 3 years ago, and even though I have pared down many things, this was so fun! My adult daughters were laughing at me and cheering me on. Thank you so much! I did it! Well I am working on it. It is hard for me to let go but your list has helped me! I did it! I keep doing it until I get enough in my house. I live in Curitiba / PR – Brazil. With my husband and two sons who are sensitized to the campaign, we are going to our goal. Thank you for the encouraging email! What a great way to start my weekend…busy work but energising nonetheless. I did it. Good kickstart for the new school year! This is the first thing I’ll do in the morning! Looking forward to seeing a difference. Thanks for the motivation. The race against the timer got my hoarder son involved – he finally parted with 15 nerf guns and 35 items of old clothes, while I chucked out years worth of craft supplies and never-to-be-used plastic cutlery. Please do this periodically Courtney, what a fantastic and effective challenge! I DID IT!!! And my hubby helped! At first I thought “No way!”, but we ended up clearing out 344 items in just 40 mins. I think we just might try this again soon – probably lots more in the house that we can get rid of! It was a fun challenge to find the items and made the “letting go” process easier because we were trying to find 100 items before the timer went off! I did it!! And then some more! Craft supplies and home school resources that we are done with! A linen closet that was jammed full with unused things. I feel free! Oh, I’m SO doing this. Thank you Courtney, for the idea. I love how you broke it down into bite size little chunks with ‘x’ amount from each room – brilliance in action! Love this, I’ll post when complete! I did it!! Love this ‘quick burst’! I was stuck and needed a little motivation. This was perfect. I think I may continue with these as I’m on my ‘second round’ of declittrring our home. Thank you. Appreciate your thoughts and ideas. Love this ‘quick burst’! I was stuck and needed a little motivation. This was perfect. I think I may continue with these as I’m on my ‘second round’ of declittrring our home. Thank you. Appreciate your thoughts and ideas. Thanks so much for the inspiration and the practical help of identifying categories! I’m going to do it! I did it! 2 parcels sent stuffed with craft supplies for charity sent off and 2 boxes out of the door to go to the charity shop! I did it! Was in the process of decluttering our bedroom this weekend and this was just the push I needed to keep moving forward! Thank you! I did it! I don’t have much to begin with (all of my things fit in my car with room to spare) but I still managed to find lots of little “just in case” items and things that are occasionally useful but not often enough to keep them. Just when you think you can’t pare down anymore, you can! I Did it! Wish I could post a pic here. The pile got up to 125 items in just 45 minutes. My kitchen and bathroom drawers are definitely more usable now! I did it!! I knew I only had a limited amount of time while my hubby took my son to a play date so I got started right away. It was longer than an hour but I got rid of more than 100 things!! Every time I declutter, I think I’ve gotten rid of as much as I can think of…until I do it again and find more. How crazy that we accumulate so much, but so little of it adds value to our lives. I’ve always focused on time together with family and friends more than things, but things just keep adding up! Get rid of stuff and feel better is the opposite of what you constantly see everywhere telling you to get more and more and bigger and better and more expensive, but it’s true. Each item is like a little weight lifted off your shoulders, and your mind! I did it! 100 seemed like a big number, especially since I don’t feel like I have a lot of stuff. But lo and behold, did that pile appear! The crafts and bathroom areas were big areas of focus. It appears I’ve finally gotten ok with letting go of projects that were well-intentioned but no longer interest me. Thanks for this kick in the pants. I did it and it was easy!!!! I finished in 45 minutes! Your tips of places to start were very helpful. I got 26 things out of the master bathroom in about 5 minutes. I’ve been working on your 333 wardrobe challenge but I still found 2 pieces of clothing I could get rid of too! The rest came from the kitchen and home office and the last few came from my craft room which was hard. I really felt an adrenaline rush to do this and I’ll try to do it again soon working just in my basement! Thanks for the inspiration!!!!! I’m going to do it tomorrow! Thanks, Courtney, for the great list of ideas — it’s really really helpful. I’ve decluttered a lot, but as others have mentioned, stuff creeps in! I’ve been “making my list” as you suggested, and I’m raring to go! I might wind up doing it tonight after hubby is in bed, lol. My craft space is where I’m going to start. . . . I did it, and my husband actually got inspired and cleaned out one of his junk drawers too. 111 things gone! Thanks for the push! I did it! I started the tiny wardrobe this summer and that has spilled over to the rest of the house. For example, I donated small appliances on the kitchen counter we don’t use blender, coffee maker, knife block, spice rack. Turns out we had enough room in the drawers for spices and knives. And our one hot water pot works for tea so don’t need the coffee maker anymore. I did it! But I’ll be doing it again and here’s why. I set my timer for an hour and started in my kitchen at 3:30 pm. I ended up staying in my kitchen, and cleaned, organized and wiped as I went. I wanted to feel complete when I was done, not like I’d just ransacked my kitchen and created chaos. But when my phone went off at 4:30, I wasn’t done and I wasn’t at 100. So I reset my phone for 5:00 and went through the rest of my kitchen, and also did my bathroom and found another 60 items. So in total I spent 90 minutes and had 160 items when complete. Now I get the point and importance of choosing only 10 (or 20) from each room you’re in and to continue til you have 100. My intent was to feel complete in one space before moving on, and to have it orderly at the same time, not just find the stuff….which was the whole point of this exercise. Next time I do it, I’ll follow Courtney’s recommendations and simply find the stuff and organize after. I didn’t post on social media because I didn’t follow the same format and didn’t come in under an hour… More to come! I did it! Lots of little bitty things, some baking pans I never use and lots of books we never read. Will definitely do this again another day. Thank you for the inspiration. And I did it before I got your mail. Today I decluttered a complete cabinet with material (I am a graphic designer). The big drawer with the pencils and pens tok me about an hour and now I have more than 100 pens to donate a kinder-garden. I never thought I could let so many good pencils go … and indeed, I decluttered all the other drawers and and finally the cabinet. Just a few items survived and now I have a great, curated collection of stuff I REARLY need. Dear Courtney, thanks for all the inspiring posts before! I did it! Having done a lot of decluttering in the last year, I didn’t think there were 100 things left. Then I found the 2 boxes that never made it to Goodwill last time. I added a few things, gave some pretty silk fabrics (not pictured) to the neighbor (Halloween, princess costumes, etc) and out the door with the rest. Thanks for a much needed burst inspiration! I did it!!! I decluttered more clothes and the plastic hangers they were hanging on. 30 hangers plus 3 bags of clothes (10 underwear, 5 shoes, 20 shirts, 6 pants, 4 shorts, 2 skirts, 4 PJ outfits, 1 bath robe) wow, I have lost 93 pounds and the clothes do not fit, they were too big. I took them to Goodwill. Who knew Goodwill was open on Sundays for donations. I went through the food cabinet in the garage and got rid of old food (10) then threw away 8 magazines. Still a work in progress. Now on to the bathroom. Vicky, congratulations on your weightloss of 93 pounds, the ultimate decluttering of self! How did you do it and how long did it take you? Please share tips, I have the same goal – as well as losing “the stuff”. Including the plus size wardrobe.. I did it! Last weekend I decluttered the attic. But you have inspired me to do more! And this challenge was so fun. I feel lighter and think I may continue with these, as I am on my ‘third round’ of decluttering our home. Thanks for the motivation! I did it! After working with Project 333 for about 5 years, I thought I’d nailed this decluttering malarkey. Well it seems not! I thought I would ‘just see’. 1 hour and 152 items later, I have another healthy donation pile of kitchen, bathroom and general stuff clutter. All reconciled receipts have been shredded, unwanted websites have been ‘unsubscribed’ and I have finally put the water filter jug and spare filters in the donation pile. Off to the charity donation bin now…. I did it! (With a toddler underfoot, too!) I’ve been meaning to sort through his old clothes for donation/keep/pass on to friend’s babies and it felt SO good to clear out his closet and drawers. We put on some good music and got to it this morning – all before 9 am! Thank you for the inspiration!! I did it!!! It feels so good. I love the idea of making a plan of attack then setting the timer so it doesn’t get out of control. It really worked. I was so excited I shared the idea with my sister. Thanks for the inspiration . I did it! It is so freeing to help these things out the door. I enjoy being in my home full of memories and experiences rather than things. Thank you! I got rid of 100 things and filled the trunk of my car and drove straight to donate them. I think setting the timer helped – I felt like I was playing beat the clock lol. I did it! And was so energised afterwards I did some DIY that’s been hanging over me! Thank you! Needed to do this x5. One down. Did my bathroom, kc leaning supplies and garage. 110 today! I DID IT! !…and it always feels great to let go of things that I no longer have use for. It also makes cleaning a lot easier and no pressure is felt because I have less stuff to dust and move around. I’m sure once my children move out of our home I can decluttered more but right now we are doing it step-by-step. I did it! I did it! I did it!!!! 3 times to be exact! My life has been over run by stuff. My stuff my kids stuff. My fiancées STUFF. my life has completely went out of control! I purged once Friday night! Once Saturday! And once Sunday! 3 hours of purging and most was trash or broken damaged items I had guilt throwing away! Why I have no idea! I feel a huge relief! Thank you Courtney!!! I did it! I went through my makeup, lotions, nail polish, hair accessories, jewelry, hair product, travel bin (mini bottles of everything! ), my linen closet, my medicine cabinet (why do I have so much expired medicine?) my bathroom mirror, and my front closet with shoes and jackets. I have one bag of donation items, was able to trash 2 bags of items that were no longer usable. My goal was go to through my DVD collection and recycle the DVD and CD cases I have but I was *exhausted* after this first sweep of decluttering, so I’m saving it for my next round this week. I did it! It took me more than an hour though, and I let go of more than 100 things. I had just taken two car loads of goodies for recycling last spring, after having had a yard sale with tons of things going out the door last fall, so this involved some deeper digging. And the thing is, there’s still “stuff” that can go. Bit by bit is getting more and more frequent. I see my home becoming more and more spacious… Thank you, Courtney, and everyone involved, for your continued inspiration and support!!! I did it! I got rid of over 100 clothing items in round two of cleaning out my closet. It feels awesome. I can’t believe I was holding onto this stuff for so long. I’m a glass half full person, but I think I prefer my closet half empty! I’ve been doing this for about a week now as I have been purging my apartment of things I do not need and have been giving them to a donation center. Thank you for this post, especially the part about aspirational items. I’ve been clinging onto a few items of clothing that were meant for a life with an ex that never happened. That part was a reality check that I desparately needed. It’s amazing the amount of emotional baggage I have unloaded since starting this process. I did it! Felt so good to sell/donate all the clothes that are too small for my girls, shred papers from the year 2000 (literally. Yikes.) and free up an entire room to become a super useable space that our family and our guests want to be in! Thanks for the motivation! Project 333 is on my summer to do list and summer is fast approaching an end…this was a good reminder of how freeing it is to live with only what you love & use. I know my closet will be the same. I did it! I have been wanting to purge for a long time. I kept reorganizing. As you know, that never works. I didn’t stop at one hour. I kept at it all day. Mostly donated items. I held on to so many things “just in case” or “maybe I’ll sell this”. Forget it. It’s gone and I feel great. Next project is my paperwork and I’m going to attempt project 333. A couple of months ago I paid my cleaner to ‘buddy’ with me and we did a significant cull of my garage and made some excellent progress – discarding loads of paper and donating various items. Today my cleaner assisted with culling more items from the kitchen cupboard and then we achieved loads of progress in the office. Many, many items have been discarded / donated. And he keeps me on-task! My cleaner will assist again next week … we’ll finish culling the office and attack the garage once again. My aim is to downsize from a 2 bedroom, 2 bathroom, 2 car garage to a 1 bedroom with study, 1 bathroom, 1 car garage. There’ll be less to manage, more time and more $ in the bank. A great win on many fronts!! I did it!…and I might do it again tomorrow! I DID IT!!! Thanks for your inspiration. I read your blog faithfully. I did it! And thank you for the inspiration to do it! My future purchases are going to be smart and practical. My kids and I are on board with Project 333 (hoping my husband will join in soon). And I’ve successfully tackled craft room, kitchen, linen closet, laundry room and bathrooms! The office is next! I did it! Felt so good to do a burst, helped me get out of my head and listen more to my gut. Thanks! I did it! This took me a little longer than an hour because I recently moved and I had to go through a lot of boxes and bins, but I managed to get just over 100 items. It honestly felt so good to challenge myself like this. I donated most of my stuff and sold some toys so I made $5.35 doing this as well. I think I will make this a weekly event as I continue to purge. I did it! I even got the kids to help. They purged clothes that didn’t fit, were stained, or they just didn’t love. The kids were excited to have more room in their drawers too. We also cleared out unplayed with toys. Wow! I’m decluttering my entire home, which I started a few weeks ago. But the 100 things in one hour was so liberating! I went through my home office, and realized I’m holding onto cords … USB cords, camera cords, who-knows-what-this-is-cords! I haven’t used them in years – YEARS – and they were just sitting there. I even tried to organize the cords a few years ago, but I still haven’t used any of them! Whoosh – out the door they will go! Thank you! I decided I wanted to do 100 physical items plus I unsubscribed from 10 mailing lists. I’ve been decluttering a lot and thought I would have a really hard time finding 100 items, but it felt so good! Thanks for the nudge, Courtney. I usually do this in January, but the more I thought about your challenge, the more I thought of things I could unload. Don’t know how many items since I didn’t count, however, took items to two different thrift shops (book, clothes, housewares, material), four items to electronics recycling, & expired OTC meds to drug recycling. And three old sheets cut up for garage rags for my husband & the neighbor man. Feels so good!!!! unloading all that stuff! I did it!! I cleaned out so much stuff! I actually needed to do a little rearranging in my house to make a guest room so I was able to declutter even more during this process. It feels so good! I Did It! And it was refreshing! Set the timer, and buzzed through the home with two donation boxes and one full trash bag in less than an hour. Over 100 items have left the house today and it’s wonderful! Hi Cathi! You won a care package. Please send me your mailing address: courtney@bemorewithless.com. I did it!!! Actually all from just the kitchen. What was great about it was that I didn’t have time to think. Yes or no, keep or release became my mantra and things became easy. I still got distracted and at the end of the 60 minutes had set 124 items free. I did it! I’ve been an aspiring minimalist for over a year now, but I know I still have some excess, and this helped push me to let go of some “maybe” items, some little “just in case” things, and a handful of useless papers. I feel that much closer to having just the right amount of “stuff” for me 🙂 Thanks, Courtney! Love following you! I did it! And I think I can do it again, more than once! Went through cabinets in the LR to clear out magazines, catalogs, misc. decorative items, paint sample cards~ and so much more. Some tossed in the trash, some boxed up for donation. I did it! What an eye opener it was to seem far more than 100 things to get rid of, after I had already been on a decluttering rampage! Thank you so Much for this. I know that I will be doing it again in a few days. Setting that timer sets my competitiveness, and I’m ready to go! My friend is a hoarder and chronically disorganized. I usually carry a plastic bag in my pocket and when I was going to sit in the front seat of her car, I picked up 50 pieces of trash and threw them away. It took less than 5 minutes. I was going to dump the bag and fill it up again, but she stopped me. She says she can’t stand picking things up. I said the mess wasn’t infinite. Pick up 50 things every day and your car will be clean. I found over $12 in cash while cleaning up. Hi Heather! You won a care package. Please send me your mailing address: courtney@bemorewithless.com. This is awesome. Thanks for the idea. I’m going to declutter tomorrow morning. I did it! ….. and I feel so great about it. Thank you for the motivation! Such a good idea! I usually go room-by-room every couple months, but this is a somewhat quick way of decluttering in between my more intense decluttering days. I did it!! 100 items out with 20 minutes to spare! I’ve done a fair amount of decluttering since discovering your website and some other minimalist inspiration. I’ve never considered myself much of a collector of things, but it’s amazing how much more you own than you realize. Great motivation to keep going! This coincided nicely with my de-cluttering spree in my office, which I am preparing to work at home in! Getting rid of that dead weight feels so good! I did it! I actually didn’t think that I would have 100 items to get rid of since I do this type of activity regularly. However, I did have several bathroom samples that I had been collecting to find a mask that I enjoy. My husband enjoyed doing this with me. I still have some files to clean on my computer, but my bathroom, closet, bedroom, and kitchen are all reset to essential items only. Feels great! Thanks for the gift of the challenge! I did it! I did some every day all week and kept a tally, went way over 100. Everything from shampoo to sheets, old magazines and craft supplies. Some donation, some trash and a few things to sell. I think I will aim for ten items a day for a while and see where that gets me. I did it! So cathartic! I got rid of 100 things only from my wardrobe and bedroom! I feel like I need to do a decluttering burst for each room! How do you deal with emotional items though? I had to leave lots of things I don’t use anymore just because they are too emotionally charged… thanks for the challenge! I did it! Great tips for finding some of those hidden areas of clutter. I discovered I was hoarding years of vehicle registration when I cleared out my glove compartment. I was extremely prepared in case I had gotten pulled over! Ha! I did it! This technique really worked for me. I’ve done the minsgame, but, for me this worked better for me. I feel it’s less emotionally exhausting to do this one time burst vs daily decluttering like the minsgame. I easily got rid of over 100 items in under an hour. You’ve inspired me to do a burst every Sat & Sun. With only 2 hours per week, I could potentially get rid of nearly 4,000 items by years end. Sounds fantastic to me! Thanks Courtney! I did it! So much easier than I thought. It took 35 minutes to get over 100 things out of my house. Thanks for the motivation! The key was doing the quick 10 lots of places. Loved that! I did it! And so did my husband! In under an hour we cleared out about 400 items of junk and donations. He’s really into this whole purging thing now and wants to do it again. This is very unlike him! But so awesome! Thanks for this activity! I did it, out it went and that’s all there is to it! Thank you for your inspiration. I have a long way to go but I made a start. I’ve been giving away items for 18 months and didn’t think there was more to get rid of. I figured I’d give it a try and see what happened- well 55 minutes and 115 items later I feel delightedly surprised! I’ve gotten 4 others to do this and we’re donating he items tomorrow morning and grabbing coffee. Courtney, your blogs have been a touchstone for my journey to simplify my life. Thank you! Thank you! I did it! I took a little over an hour to clear out our garage. We have been good to keep our house mostly minimalist, but our garage had become the room of forgotten things. It’s not complete, but got a pile of things to giveaway and a few bags of trash and recycling to leave the space next week. I’m looking forward to my next hour decluttering challenge! I did it! I was “decluttering” my email when I found this challenge and it got me motivated to give it a try. I have been decluttering for almost two years- some areas feel “complete” and in others I have a long way to go. The list of categories you set were really useful and I used it to make a list in my journal before I started. I set the timer for an hour and finished in around 50 minutes. It took me about another 45 minutes to get things thrown out, recycled, or organized by donation-location and into the car. Here is my original list with notes (notes in parenthesis were made during the 60-minute challenge). -20 things from arts and crafts area (beads! 1000’s!) I can’t decide how to quantify this, it’s either 2 or multiple 1,000+. I have been thinking lately of paring down my bead collection. I have 4 bead containers, two large and two small with many, many. many beads in each. I quickly scanned the contents and got rid of the 2 large containers, holding back the two smaller ones and a few tools… I’ll go back through those another time. Do I really need this bead collection I have toted around for over 20 years? -10 things from closet (Nothing from closet 🙂 …? try again… 3 things & reflection on fear of scarcity). First sweep I found ZERO items and wrote the note “nothing from closet :)”, then wrote “…? try again…”. This time I came up with three items, 2 old bras and 1 scarf. I have taken the 333 challenge and been really mindful about my closet since I got serious about decluttering on New Years 2016. I have gotten rid of hundreds of items from my closet. Taking a close look at everything in my closet while the timer was ticking away today left me with two thoughts- 1) that I am really proud of how much I have decluttered my clothing and closet, and 2) that of the minimal items I do have (at least compared to where I started) that I am holding onto and wearing items I do not love at all. These are clearly the things I liked the best of all that I have gotten rid of, though I am still holding onto things I don’t really like due to feelings of scarcity at the thought of really getting rid of everything I don’t like. So, I’ll think on that. Cathartic! The whole challenge, including writing this comment, took me 2 hours. Wow, productive Sunday! Hi Brea! You won a care package. Please send me your mailing address: courtney@bemorewithless.com. How exciting! Thank you, Courtney! This challenge got my husband and me motivated for more decluttering. There are wildfires in our region and families in need so we had opportunity to think about what we really need and donate essential items to neighbors who lost their homes this week-two car loads! My husband is now on day 3 of completely decluttering the garage and turning it into the shop space he’s always wanted. Thanks again! Spouse and I worked together on it, and cleared out a bit of clutter, including a table and chairs he recently refurbished to sell. So excited to have a cleaner, sparser living space. I found I was able to gift / donate several items to others who needed them more than I — that’s been the most fun part. I did it!! I feel relieved, but my apartment doesn’t look any different. Instead of 100 I think I have to declutter 1000! But it was very useful and fun to do, me and my daughter set a timer and ran through the house decluttering! Now I have many things to gift to my sisters and clothes to donate. Thank you for encouraging me to do this! #I did it. #bemorewithless #declutter100. I got 20-40 things from my girls’ bathroom cabinets – old lip gloss, outdated hair goo; then some glassware from kitchen, books from shelves, junk from son’s bedroom, clothes, linens. Jars, pillow, magazine rack, etc. Feels great. I did it!! Long overdue. WELL over 100 items and only made it through two of six areas I had originally set out to declutter. Only cleared out my craft cabinet and three of my four bathrooms. I could not get the boxes out the door quick enough before my husband spied something that he just HAD to keep, even though he had not seen it in over a year. Oh well, next time I will use more stealth. Setting the timer helped a lot. Going to do this again tomorrow and try and make it through the old toys and my closet. It’s time to downsize and minimize to make room for what really matters. Thanks for the wise inspiration and motivation. I did it! A big stack went out to my sister’s garage sale, and more went to donate. The digital stuff is just gone and it feels good. Did some bonus reorganizing afterwards and I’m motivated to clear out even more. I haven’t had any visible clutter for awhile, but all the hidden nooks and crannies and ‘organized’ cupboards are what I really need to work on. If I don’t use an item regularly or love it, I want it to go to someone who needs it more. Bet having the digital stuff done feels great! Thats my next big tackle, but I don’t have the mental fitness for it just yet ;).Any hints? It was challenging because we’re getting ready to move and so we had already done quite a bit of decluttering, but having the time and number goals forced us to make quick decisions rather than saying “we’ll come back to that later”, but we did it! (Although to be completely honest it took a little more than the hour because our 1 year old kept interrupting). Thanks for the wonderful motivation and easy tips on getting rid of stuff that just isn’t serving me. Thank you for your inspiration. I wouldn’t have done this without your post. I declutter all the time but I filled 2 bags with hobby materials to give away. I have a big box of my late mother’s books to send to her friend and at least 20 potted plant cuttings to pass on. And my daily bag of recycling. I did it! 100+ items in about half an hour. I need to make more of an effort to minimize more- we just moved into a bigger apartment and I feel like I should fill the space! We did it! My 9yr old boy and I whipped through the challenge in 28minutes! Thanks for the kick I needed to get started. Feels so good now. I did it! Thank you!!! Now I actually have space. I got a head start for a church yard sale, but took the picture for fb with the items in the bag (trash) or visible in the background… donating anything that is leftover!!! It is never coming back here. Blessed and released. I did it! Thanks for this post, I am slowly getting control of things again. I did it! I was initially inspired by the flooding in Texas thinking to myself “We could lose all of our things in a few hours. Keep only what you need.” I searched for some minimalism tips on Pinterest and I already follow you so I thought this challenge was amazing. Definitely quicker and easier than I thought. I still have paper to tackle but getting started really helps! Easiest way for me was to check cabinets and places in my closet that I know I have things but rarely go into. Thank you. My husband and I each did it with time to spare, so kept going. A fun challenge and glad to be rid of these things. We took some photos but I can’t seem to get them to this space. Went through a box from our basement storage space (we live in a 4th floor condo) and found more to give away. There are some old ties my husband will give away and a few old dress shirts. Always something to get rid of. I did it! It was surprisingly easy. In less than an hour I got rid of old DVDs and books we no longer need. I purged unused miscellaneous items from my kitchen drawers, costume jewelry I never wear, and items from my home office. About half is headed for the garbage and the other half is in the trunk of my car so that I can drop it off for donation. Thanks for the inspiration. I did it… Over 100 items in 40 minutes! OK, 1/3 of the items were socks with no mate, but who cares? Looking at that box of socks annoyed me, leading me to think “the kids need to be more careful”, etc. It’s liberating to let them go. I’m excited to let go of my next annoyance, probably old magazines. I did it – and it wasn’t that hard. I ended up decluttering 175 items in the hour. I placed everything on the boulevard “free” pile and most of it was gone in 48 hours. The remainder was either recycled or put in the trash. I don’t miss a thing. I’m going to challenge my husband & kids to their own decluttering burst. A great challenge and a great way to spend a little time this Labor Day (in the states). Thanks for the inspiration and motivation, Courtney! 25 old recipe copies I don’t need – I don’t bake! I did it! Definitely more than 100 things, and I don’t feel like I’ll miss any of it. Some declutter highlight items include: a “shack pack” (a.k.a. overnight toiletry bag) from when I I used to spend the night at my now-husband’s apartment (we’ve been married 3 years, by the way…), empty flash drives, piles of business cards for contacts I don’t talk to, stacks of take out menus for restaurants in cities in which I no longer live, shoes that give me blisters, a dress with straps that constantly fell down despite having been altered, a shirt that makes me look frumpy, eyelash glue, a protest sign, Ecuadorian tic tac toe, ugly teapots, a plethora of scarves, and much more! It was actually only 43 minutes because my son woke up early from his nap, but it was effective nonetheless. I ended up getting rid of close to 200 things, and that’s after my husband swore I wouldn’t be able to find 100! I’ve been following you for a couple years now, and I have let go of a shameful amount of unnecessary objects in those years. I get so many comments from friends ad family about how clean and peaceful my home is, but there were still a few areas I just couldn’t get through. This decluttering burst did the trick and I thank you!! I did it! It always feels great to tidy, declutter, donate, and re-sell where I can… I feel like I’m helping me, and I’m helping someone else. Always a win-win!! Thank you for the challenge! I did it- your decluttering burst. Such an inspiring idea ! Thank you. To clean the complete store cupboard took an extra hour. But it looks so neat and clean, now. Time well spent. The decluttering of the rest of the house needed only 38 minutes, then. So I even rummaged through my garden and put three withered trees on the compost. I didn’t count the items. I estimate: nearly 100. This exercise was so wonderful! Thank you for constantly being a source of inspiration. I know this is a month late but I finally did it! It was amazing how much I could gather up in each of those categories and without much hesitation at all to fill up 20 things at a time and donate bag it or put in the trash. it was fantastic!! I plan to do this again tomorrow and probably the next day that I have off ! I didn’t I feel overwhelmed or have time to think about getting distracted in a major cleanup or major decluttering. Loved this, thanks!